When I received an offer a couple of weeks ago to check out the Connected by TCP "home smart lighting system" -- which lets you remotely dim, control and schedule the lights around your home to turn on and off using a smartphone or tablet -- my interest was immediately piqued. I also quickly asked myself if I really want, or need, smartphone-controlled lighting and wondered whether I'd use the system when the novelty wore off. "Connected home" gadgets took center stage at the 2014 CES in January, but many of those devices seemed more gimmicky than genuinely valuable. So I was admittedly skeptical of TCP's system. Get Connected with TCP - 1:30 Product Overview from TCP on Vimeo. I've been using Connected by TCP for about a week now, and I can honestly say I'm already a big fan of the concept, as well as TCP's implementation. It's not perfect, and it takes some getting used to, but I can see these "smart light bulbs" becoming the default bulb in my home. Here's a quick breakdown of what I like about Connected by TCP, and what I don't, as well as some details to help determine if this home smart lighting system is for you. It could not be easier to set up the Connected by TCP system, and you don't have to be particularly tech savvy to get it up and running. I used the 11-watt LED 3-bulb kit with the TCP gateway and remote control. The kit contains all the components you need, but you can buy each part separately, or purchase a few or as many bulbs as you want. The company also sells 10-w and 23-w bulbs. Using the mobile app, you can turn your lights on and off, as well as choose from a number of dimmer settings, from anywhere in your home when connected to your Wi-Fi network. If you're out of range of Wi-Fi or you're away from home, you just log in to your TCP account via the app and use the remote access feature to control your lights. The process, using Wi-Fi and remote cellular connections, was seamless every time I tried it. I found the dimmer feature to be particularly useful. I live in an old building that doesn't have any dimming light switches. Thanks to the Connected by TCP bulbs, I now have dimmable lights in three rooms, all of which can be controlled remotely using a mobile app or the remote control that came with the system. There are 10 "levels" to choose from when dimming, so you can choose how much or how little light you want. The Smart Control feature is also valuable. The customizable Smart Controls let you set certain times you want your lights to turn on and turn off each day, as well as the "dim level" for each setting. For example, you can set your bedroom lights to turn on at 6 a.m. each day, to wake you with light instead of a blaring alarm clock, and then shut off on their own at 7 a.m., when you're on your way to work. Or, as a security measure when travelling, you can set your living room lights to turn on at 5 p.m. each day and turn off at midnight. 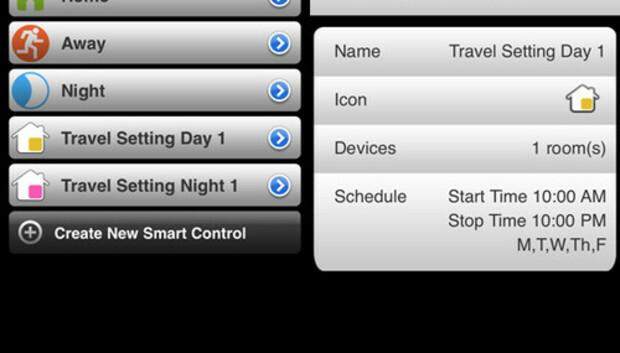 The Smart Control feature works exactly as advertised, and it's very easy to set up and use, just like the rest of the Connected by TCP system. Simplicity is Connected by TCP's real strength -- which is important, because such a system could easily intimidate less tech- savvy users. Finally, I appreciate how environmentally friendly the Connected by TCP LED bulbs are. When used effectively, the system can reduce the amount of time you leave unused lights on around your home. Each 11-w bulb is rated for 25,000 hours of life and has an estimated energy cost of $1.32 a year, according to the manufacturer. I'm clearly impressed with Connected by TCP, but there are a few "quirks" worth mentioning. I don't have many bad things to say about Connected by TCP, but the most notable issue has to do with how my significant other is less inclined to use a smartphone to control the lights than I am. She understandably still wants to use the light switches around the house, but Connected by TCP gets "confused" when one person uses the mobile apps to dim and control the lights and another uses light switches. For example, if I turn on our office light using the TCP Lighting app, but my significant other turns it off using the switch, I'm unable to turn it back on with the app until I flip the power on the switch again. If I attempt to use the app to turn on a light that was turned off using the switch, I see a small red "X" over the light icon in the app. This makes sense; if the power source to the light is turned off, you won't be able to activate the light remotely. But because we've been using the light switches for so long, it can be difficult to remember to use the apps -- and all it takes is one flip of the switch and you can't control a light using the mobile apps. On the flip side, if I turn off our office light using the TCP Lighting app, and then someone wants to turn that light back on using the light switch on the wall, she's out of luck; if the bulb is turned off by the app, the light switch won't work. So it's kind of all or nothing with Connected by TCP. Everyone in the home either uses a smartphone, tablet or the remote control to turn lights on and off, or everyone sticks to light switches. (Or the occasional confusion ensues.) This could be an obvious issue if you have lots of people in your home or have children who don't have access to a smartphone or may not be old enough to use the remote. All the smart bulbs in your home also need to be connected to a Wi-Fi network. If there are any rooms in your house that your router doesn't reach, you won't be able to use the Connected by TCP bulbs in them. The system and the individual bulbs are somewhat expensive, especially if you want to outfit your entire home with Connected by TCP bulbs. The three-bulb kit I reviewed includes all the components you need to get started. TCP charges $142.99 for it, though you can find the same kit for less at Home Depot ($109.99). Individual 11-w bulbs from TCP cost $27.99 though, again, you can find them for significantly cheaper online. That said, LED bulbs last much longer than traditional light bulbs and use less energy -- and even "dumb" LED bulbs costs almost as much as the smart TCP bulbs. For example, a comparable 11-w GE LED costs $24 on Amazon.com. After reading a number of user reviews on TCP's website, Amazon.com and HomeDepot.com, I noticed that a number of people mentioned that the TCP bulbs get quite hot after being used for a while. Personally, I didn't notice the problem, and the traditional light bulbs I used in the past also got hot during use. But enough people mentioned the heat that it seems worth noting. The Connected by TCP home smart lighting system is pleasantly simple to set up. It works just as advertised. It's impressively customizable, and you can add up to 250 different smart bulbs to one system. You can dim lights in your home without dimmer switches. It's controllable via mobile app, remote control or Web interface. The Smart Control feature lets you automatically turn lights on and off at predetermined times and on certain days. Finally, the remote access feature lets you monitor and control you home lighting from anywhere you have an Internet connection. Unfortunately, Connected by TCP is designed to be controlled using its mobile apps or remote control, and using traditional light switches along with the apps can lead to problems. It's also somewhat expensive. TCP's isn't the only smart lighting system available, nor is it the most feature packed. Philips' Hue system appears to have many of the same features as Connected by TCP and it lets you customize the color of your lighting -- but it's even more expensive. Overall, I recommend the Connected by TCP system to anyone who wants enhanced home lighting options and is willing to deal with a bit of a learning curve. Depending on how many people you have in your home, and how willing they are to learn a new lighting routine based on mobile apps, the smart bulbs may be better suited for some areas of your home than others. You can use as few or as many Connected by TCP bulbs as you choose, and the bulbs themselves are much more environmentally friendly than traditional light bulbs. Learn more about Connected by TCP on the manufacturer's website.